AP Badi Bata-AP Badi Pilustondi Programme/AP School Calling Strategy, Objectives, Expected Outcomes/ A Special Drive badi pilustondi programme in all AP Schools: Malli Badiki/ Badi Pilustondi Programme in all AP Schools: Government of Andhra Pradesh has launched “Badi Pilustondi” Programme as one of its campaign programme. Education for All is one of the important themes of the Social Empowerment Mission. Govt. of A.P having fully realised the importance of education, in order to improve all social and economic indicators is giving top priority to education sector. Primary Education, School Education are the foundation for the improvement of overall education scenario in the state. “Badi Pilustondi”(School Calling) is a continuous programme to improve the situation in the schools and there by education scenario. To achieve this, community, parents, district administration and teachers have to play their roles effectively in “Janmabhoomi-maa vooru” programme launched by the Hon’ble Chief Minister. Information on education related issues shall be furnished in the format communicated by the Planning Department to the State Project Office, SSA, A.P, Hyderabad (plgaprvm@gmail.com) every day in the evening. 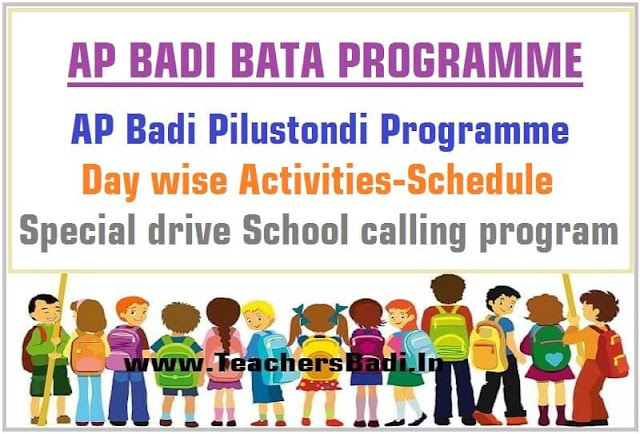 The objectives of “Badi Pilustondi” shall be achieved through community participation, parents’ involvement, effective teacher participation and also regular monitoring by the education department. The knowledge of NGOs, CBOs and Corporates will also be utilized in improving the infrastructure as well as quality of education. The resources under SSA and RMSA program shall be utilized fully and effectively and in a transparent manner.It is observed that though schools are provided grants under SSA and RMSA, many schools as on today do not have television facilities though number of lessons are being telecasted through MANA TV. Timely utilization of funds will ensure better grants from Govt. of India. Success lies in creating awareness among parents about importance of education and highlighting the benefits being provided by the Govt. to take this education to their door step. Awareness shall also be created about the mid-daymeal programme. It is established that many of the children are not utilizing the mid-day-meal as food is not tasty and not being served hot. The local community and School Management Committees should be made active in effective supervising of mid-day-meal benefit being availed by all the children. The supervisory officers in Education Department like., MEOs, Dy.EOs, DEOs need to visit schools on regular basis to ensure that academic calendar is followed and syllabus is completed as per time line. Children enrolled should be retained and drop outs arrested fully. The performance of the children in various aspects should be reviewed and monitored. It is revealed in many Annual Status of Education Report (ASER) and State Level Achievement Survey 2014 (SLAS) the learning levels of the children in Govt. Schools is far from satisfactory. There is a need for making concerted efforts for ensuring effective academic monitoring of schools in order to improve learning level of students in all classes. “Badi Pilustondi” campaign is launched with the following objectives. 3. School should have the high quality infrastructure. The minimum requirement like., number of class rooms, toilets, drinking water etc. as defined in the RTE Act shall be fulfilled in all schools. 4. Quality education shall be imparted in all schools. 5. The schools shall also impart about the environmental issues like., Tree Plantation, Water Harvesting etc., to child. 6. Children shall be provided with excellent quality mid-day-meal. Mid-daymeal shall be provided in adequate quantity as per norms. 7. The mid-day-meals shall be prepared in hygienic environment and the hot mid-day-meal shall be served to all children. 8. All children shall be provided with entitlement like., Text Books, Uniforms as per the time schedule. 9. All children shall be imparted with the quality education, regular monitoring and continuous evaluation of the children learning outcomes and regulation of teachers will be ensured. 10. All Adults who are illiterates shall be made literates in the coming four years to achieve 100% literacy. While children below 14 years will be encouraged to enrol in schools, dropouts above 14 years can avail Open School system. 11. There shall be transparency in implementation of all the programmes and in incurring expenditure at schools. 1. All Out of School Children in the village shall be enrolled. 2. RSTCs/ NRSTCs shall be opened wherever required to impart bridge courses to Out of School Children. 3. All toilets sanctioned by the District Collector under RWS, SSA and RMSA shall be completed before 30.06.2015. 4. All kitchen sheds and ACRs sanctioned under various schemes shall be completed. 5. Large number of Additional Class Rooms (ACRs) are also sanctioned under SSA and RMSA but not yet grounded in many districts. – 100% grounding of works shall be ensured. 6. Funds were released for providing furniture in Upper Primary Schools and High Schools under SSA/ RMSA for the year 2014-15. District Collectors shall ensure providing proper furniture in schools immediately. 7. There shall be an improvement in the number of children taking midday-meals. Atleast 10% increase shall be achieved. 8. 100% Aadhar seeding of children shall be ensured so that there will be transparency in enrolment, teacher deployment and proper utilization of funds for free text books and uniforms. 9. The Academic Instructors approved by the Government in view of the teacher vacancies shall be deployed by the time of school reopening after Dasara holidays. 10. Schools shall make effective utilization of school grants and maintenance grants released under SSA and RMSA. This will ensure clean premises, white washing of all schools, good ambiance and availability of Teaching Learning Equipment in every school. 11. The toilets shall be maintained in good condition. Govt. of A.P has sanctioned Rs.1,000/- per month to all Primary Schools where enrolment is more than 60, Rs.1,500/- per month to all Upper Primary where enrolment is more than 100 and Rs.2,500/- per month to all High Schools where enrolment is more than 150. These grants are being passed on to the schools and should be utilized effectively in maintaining toilets and drinking water source in good condition. 12. District action plan should be prepared in every district to cover all the infrastructure gaps under SSA and RMSA as per approved Annual Work Plan of Financial year 2015-16. Balance infrastructure gaps may be included in the Annual Work Plan for 2016-17. 13. Some issues, which cannot be covered under SSA and RMSA shall be submitted to the State Government for sanction of funds. 14. Teacher performance should be closely monitored by the MEOs. DEOs, RJDSEs and the District Collectors. Those teachers, whose performance is excellent should be rewarded through meritorious certificates. 15. All adults who are illiterates should be enrolled under “Sakshara Bharath” programme and District Collectors should motivate them to attend examinations under National Open School system and also A.P Open School system and ensure that they are made literates within coming four years.